Welcome to Day 3 of 12 Days of YEA Camp Heroes! We hope you feel as inspired reading their stories as we feel posting them. The 12 Days of YEA Camp Heroes is part of our end-of-year fundraising campaign, If Not for YEA Camp… to support youth activists developing the skills, confidence and community they need to make a bigger difference on a social justice cause they care about. You can donate here. Today’s Hero is Maddie, who came to YEA Camp in California this summer all the way from Colorado — thanks to her supportive dad Kent, who came with her to drop her off! Before YEA Camp, Maddie had already gone vegan as well as was a dedicated recycler. In her application, she wrote that she wanted support to put her passion for animal and environmental protection into practice to make an even bigger difference. “I am very interested to take an issue I deeply care about to the next level,” she wrote. “I think with the help of just one other person that I can share my knowledge and concerns with, it’ll be helpful to spread the awareness.” Well, Maddie has been blowing us away with all she has been up to since YEA Camp! 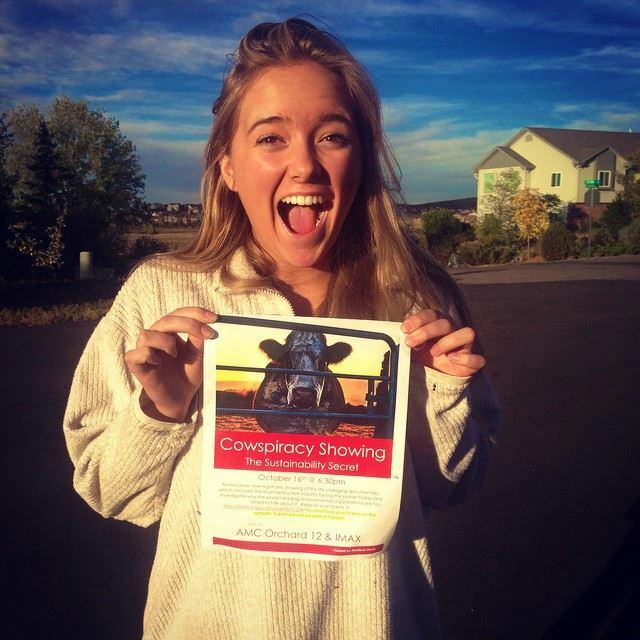 Maddie hosted a screening of the new documentary film “Cowspiracy” at a Colorado movie theater that required selling 75 tickets for the screening to happen. Spearheading this by connecting with local organizations and businesses, passing out flyers, as well as reaching out for YEA Camp’s help promoting the screening, not only did the screening happen, it sold out all 120 tickets! 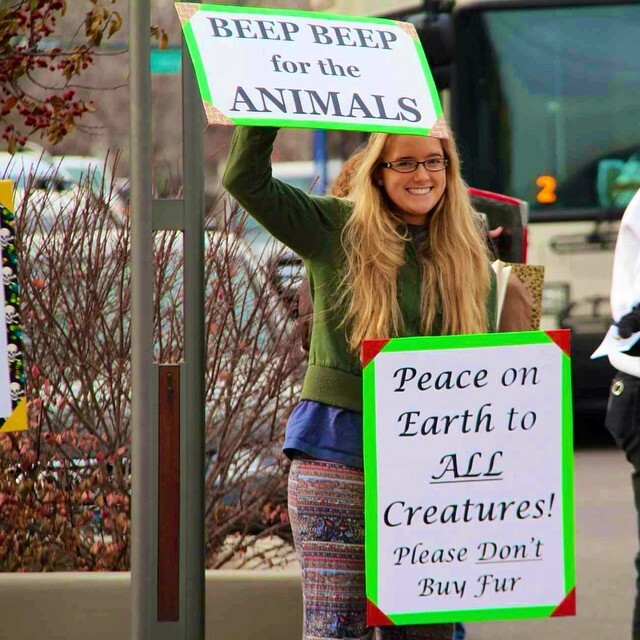 Maddie has gotten involved in local events to advocate for animals — from raising awareness about the cruelty of the fur industry to the suffering of animals in circuses, and more. And she spreads compassion with a positive attitude and a smile on her face! Maddie is active in the Teens for Oceans club at her school, which has had a huge success of getting recycling bins in her school. Maddie is currently working on getting more veg options in her school cafeteria through the Meatless Mondays campaign. And a lot more that we left out! Did we mention that Maddie is 15?! We’re sure that Maddie would be doing great things without YEA Camp, but we are thrilled that the skills, confidence, passion, and community that she developed at camp has helped launch her advocacy to new heights! If you’re inspired by our work, please support it! YEA Camp relies on donations to fully fund our program, and your tax-deductible contribution will help us to reach more young people like Maddie who will benefit from training and encouragement to pursue their passions to make the world a better place. We so appreciate your continued support. Come back tomorrow for Day 4 of 12 Days of YEA Camp Heroes! Missed previous posts? Here are Day 1 & Day 2 of our YEA Camp Heroes campaign. Want to come to YEA Camp this summer? Register at YEACamp.org! This entry was posted in Activist Profile, Uncategorized, youth activism, Youth Empowered Action and tagged animal activist, animal rights, circus, cowspiracy, environmentalist, fur, recycling, school club, social justice, youth activist. Bookmark the permalink.